Growing up in the 'Rice Bowl' State, did not make me, a 'rice eater'....I do get asked by some.... 'So, what do you cook at home, Malay food?Eat rice everyday?'. Being married to a Chinese, some thought that I've even 'converted' my husband's taste bud from Chinese food to Malay cuisine!! Heat oil in a large saucepan over moderate heat. Cook and stir the onion for 1-2 minutes or until soft. Add canned tomatoes, beans and stock and bring to boil. Reduce heat and simmer for 5 minutes. 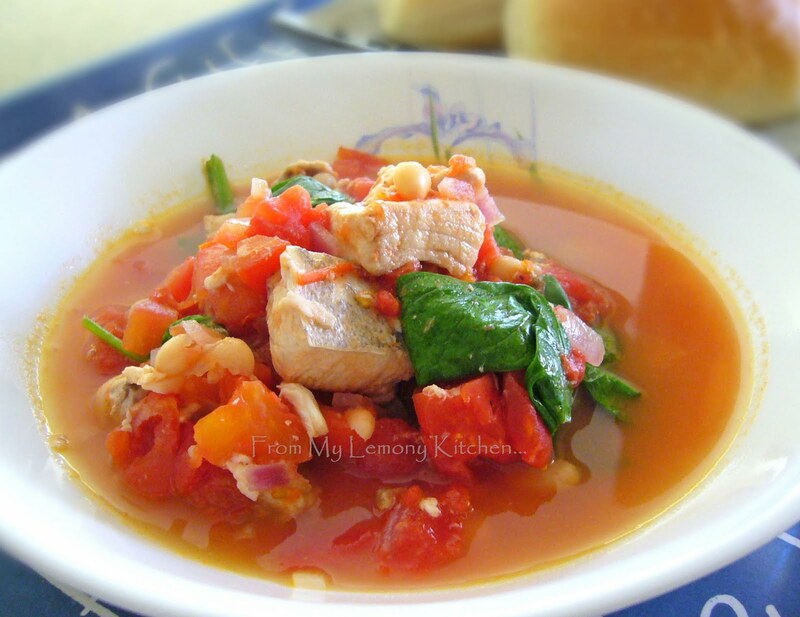 Stir in fresh tomatoes and fish. Simmer for 6-7 minutes or until the fish is cooked. Add spinach and parsley stir for 1 minutes. Season with salt and pepper. Serve with crusty bread.